Coronary artery disease is a major cause of heart failure. Although percutaneous coronary intervention (PCI) is an advantageous approach to restore myocardial perfusion, heart failure has been reported even after PCI., Patients with left ventricular systolic dysfunction remain at risk of sudden cardiac death. Exercise training is a well-established nonpharmacological therapy for patients with heart failure. However, most training programs have largely focused on endurance training (ET). Recently, the efficacy of novel exercise training modalities such as resistance training has been investigated to select the most effective modality for heart failure patients. However, there are limited data to support resistance training as an accepted adjunct therapy in this group of patients. As far as we know, no study has investigated the efficacy of exercise training on NT-pro BNP and hs-CRP levels in patients with heart failure after PCI. In addition, it is not known which exercise protocol, endurance, or CT is more effective. Therefore, the aim of the present study was to compare the effects of these two training protocols on NT-pro BNP and hs-CRP levels in patients with heart failure after PCI. This randomized, controlled, parallel-group trial compared the effects of endurance and CTs on some cardiovascular markers. This study was registered in Clinical Trial. Government with registration identifier IRCT2015092916532N3. All patients who had undergone PCI and were referred by their cardiologist to the Cardiac Rehabilitation Department of Al-Zahra Heart Charity Hospital in Shiraz from October 2015 to November 2016, 1 month after angioplasty, were evaluated for inclusion in this study. The inclusion criteria were age 40–70 years, left ventricular ejection fraction ≤40%, and New York Heart Association (NYHA) functional Class I, II, or III. Patients were excluded from the study if the following criteria were met: severe exercise intolerance; uncontrolled arrhythmia; uncontrolled angina pectoris; severe kidney or lung diseases; musculoskeletal or neuromuscular conditions preventing exercise testing or training; and signs or symptoms of ischemia. All participants signed a written informed consent before participating in this study. Ethics approval was obtained from the Shiraz University of Medical Sciences Local Ethics Committee (reference number: IR.SUMS.REC.1394113). After the baseline assessment and before the start of treatment protocols, the 75 participants were randomly assigned in a 1:1:1 allocation ratio to one of three groups: ET, CT, and control. A biostatistician generated the random allocation sequence using permuted block randomization method with 25 blocks and block size of three. The random allocation sequence was implemented by a nurse who was blind to the study hypothesis and intervention. All participants, referring physicians, research assistants, outcome assessors, and analyst were blinded to group assignment. To ensure allocation concealment, participants in each group were seen at a specific, prescheduled time, and appointments for each group did not coincide with appointments for any patients in either of the other two groups. A supervised graded exercise test to record volitional fatigue or symptoms was performed on a treadmill with the Bruce protocol before and after the 7-week intervention period. The test was done in nonfasting conditions and under medication. A 12-lead electrocardiography was recorded continuously, and blood pressure was measured with an arm cuff every 3 min. Functional capacity in metabolic equivalent value (METs) and rate pressure product in the second stage of the exercise test was calculated. Fasting blood samples were collected at baseline and the end of the study. Blood samples were drawn on the same day as exercise testing but were collected before exercise. All final blood samples were obtained 24 h after completion of the last exercise session. Serum NT-pro BNP level was determined with an enzyme immunoassay kit from Biomedica (Vienna, Austria). Hs-CRP was measured with a commercial ELISA kit (Monobind Inc., Lake Forest, CA, USA). Biomarkers were assayed according to the manufacturers' recommended protocols. Both exercise groups received training three times per week for 7 weeks. Training sessions were supervised by an experienced physiotherapist and a nurse. Electrocardiogram and heart rate were observed with telemetric monitoring, and blood pressure was measured at the commencement and the end of each session. Each training session was initiated with a 5 min warm-up and ended with 5 min of cool-down. Patients in all three groups received a pamphlet for daily exercising at home. To sum up, the exercises included ten types of active exercises. The patients were asked to do each exercise for 10 repetitions. Each exercise session at home lasted 15–20 min. The patients performed ET for a total of 45 min at 40%–70% peak VO2 predicted with a supervised graded exercise test on a treadmill with the Bruce protocol. ET comprised of exercising on a cycle ergometer for 20 min, an arm ergometer for 10 min, and a treadmill for 15 min. The first few sessions, training intensity was set at 40% peak VO2 and then increased progressively to 70% peak VO2. As training intensity increased, the patients' heart rate, rate of perceived exertion (Borg scale), and cardiac symptoms were also taken into consideration. The patients performed ET as the described protocol for 30 min (10 min for each workstation) followed by the resistance exercise protocol. The resistance exercise protocol included four exercise regimens: knee extension, knee flexion, elbow flexion, and shoulder abduction. Initial intensity was set as 40% one repetition maximum (1RM) and then increased gradually to 60% 1RM (1RM is the maximum weight that can be lifted once with correct technique through a full range of motion). Patients performed these exercises in two sets of 10 repetitions per se ssion. They were instructed to perform the exercises slowly with correct lifting technique to avoid the Valsalva maneuver. The lower limb muscle groups (knee extensor and flexors) were trained with a weight machine, and upper limb muscle groups (elbow flexors and shoulder abductors) were trained using dumbbells. The total duration of the resistance exercise protocol was approximately 15 min. Patients in the control group only received a pamphlet for daily exercising at home as explained above. According to the previous studies, the sample size was determined based on NT-pro BNP level outcome to be 25 patients in each groupwhen α = 0.05, β = 0.2 and effect size = 0.61 by the NCSS (PASS) 2007 software (NCSS, Kaysville, Utah, USA). All analyses were done with SPSS software, version 16 (IBM Inc., Chicago, IL, USA) on an intention-to-treat principle. Normality of the data distribution was checked with the Shapiro–Wilk test, and nonparametric tests were used for nonnormal variables. We used descriptive statistics including mean ± standard deviation for quantitative variables and frequency (percentage) for qualitative variables to summarize the participants' baseline characteristics. Baseline comparisons between groups were performed with one-way ANOVA. Chi-square test was used to compare qualitative variables amongst our three groups. Paired t-tests and Wilcoxon signed rank tests were used for within-group comparisons for variables with normal and nonnormal (NT-proBNP and hs-CRP) distribution, respectively. For each participant, change in values from baseline was calculated at the end of 7th week (postintervention). Between-group comparisons were tested with one-way ANOVA and the post hoc Tukey test. P < 0.05 was considered significant for all tests. In addition, the magnitude of changes was evaluated by calculating Cohen's effect size. During the screening process out of 311 patients, 232 were excluded, since they did not meet the inclusion criteria, and four other patients declined to participate. Finally, 75 patients were randomly allocated in each group. Five participants withdrew from the study due to loss of interest and other reasons that were not related to exercise training [Figure 1]. Participants completed the study without any serious adverse events. Premature ventricular contractions were recorded in six patients. Two patients in CT group had an episode of angina pectoris during treadmill exercise that was relieved after taking sublingual nitroglycerin. One patient in ET group experienced severe hypotension during two consecutive training sessions that was normalized after discontinuing exercise. Another patient in ET group had a respiratory problem, which was not related to exercise training and had to be hospitalized for 3 days. The last two patients resumed training after 1 week. At baseline, there were no statistically significant differences between groups for demographic and clinical characteristics [Table 1]. There were also no significant differences between the three groups for cardiovascular parameters at baseline (P ≥ 0.05). Changes in cardiovascular parameters after the intervention in the three groups are shown in [Table 2]. After 7 weeks of exercise training, NT-proBNP level was significantly reduced in the CT and ET groups (P = 0.004 and P = 0.002, respectively). Hs-CRP level was significantly reduced in ET group (P = 0.030), but the change in hs-CRP in the CT group was not statistically significant (P ≥ 0.05). The control group showed no significant changes in any cardiovascular parameter (P ≥ 0.05). Improvement was observed in both training groups in functional capacity and exercise test duration (P< 0.001). Significant reductions were found in rate pressure product in the second stage of the exercise test (S2RPP) in the ET group (P = 0.048), but S2RPP did not change significantly in the CT group (P ≥ 0.05). This group showed a significant improvement in peak heart rate (P = 0.005), but the change in peak heart rate in the ET group was not significant (P ≥ 0.05). The results of one-way ANOVA showed statistically significant difference between the three groups with respect to the mean change values in functional capacity (P< 0.001), exercise duration test (P< 0.001), and peak heart rate (P = 0.017). There were no significant differences between the three groups regarding changes in the remaining outcomes [P ≥ 0.05, [Table 3]. Pairwise comparisons indicated that the mean change values in functional capacity (P< 0.001), exercise test duration (P< 0.001) and peak heart rate (P = 0.023) in the ET group were significantly greater than the control group. Although significant changes were observed in the CT group, only the changes in functional capacity (P< 0.001) and exercise test duration (P< 0.001) after the intervention were significantly greater than the control group. 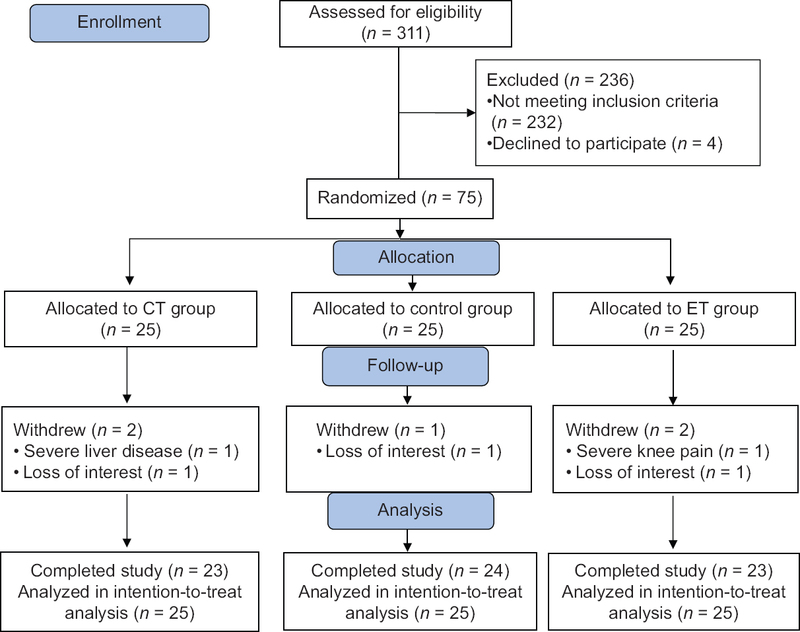 No significant differences were found between the ET and CT groups for changes in any of the outcomes after exercise training [P ≥ 0.05, [Table 3]. To the best of our knowledge, the present study is the first to compare the effects of ET with CT on NT-proBNP and hs-CRP in heart failure patients after PCI. All participants completed the study without any serious adverse events, suggesting that both exercise protocols were safe and well tolerated. Both ET and CT were effective in reducing NT-proBNP levels, and no significant change in this biomarker was seen in the control group. Our findings are in line with previous studies on the effectiveness of ET in diminishing NT-proBNP level.,, The important aspect, with which we can differentiate our work from other studies, is the duration of exercise program. Significant reduction in NT-proBNP level in a short-term exercise training program (7 weeks) is noteworthy. Studies that investigated changes in NT-proBNP and BNP concentrations after CT reported varying results. Conraads et al. found a decrease in NT-proBNP level after a 4-month CT program, Whereas Jónsdóttir et al. found no significant change in BNP with a 5-month CT program. Differences in exercise program parameters, as well as differences in pharmacological treatments among studies, may be factors in determining the amount of change in NT-proBNP level. Low mean weekly exercise energy expenditures in some exercise program may be the reason for the absence of significant changes in BNP in these studies. High levels of NT-proBNP are related to poor prognosis that probably mirrors a degree of hemodynamic compromise and increased ventricular wall stress. The reduction in NT-proBNP with exercise training can be an expression of reduced ventricular wall tension and improved hemodynamics. Furthermore, it may be indicative of improved systolic cardiac function and tissue oxygenation. Since cardiac function plays an important role in patients' functional capacity and quality of life, a reduction in NT-proBNP concentration is a beneficial impact of the exercise training. Furthermore, NT-proBNP is a prognostic marker of cardiovascular events in patients with left ventricular dysfunction; therefore, decrease in NT-proBNP is associated with reduction in cardiac events. Hs-CRP was significantly reduced only in the ET group, but the change in the CT and control groups were not significant. These findings are in agreement with the results of previous studies showing that ET can diminish hs-CRP levels., One mechanism proposed to explain the training-induced reduction in CRP is a decrease in cytokine production by adipose tissue, skeletal muscle, blood mononuclear cells, and endothelial cells., Exercise is known to attenuate inflammatory markers associated with endothelial dysfunction and to improve endothelial function by up-regulating endothelial nitric oxide formation. The anti-inflammatory effects of exercise training may improve symptoms in patients with heart failure  and reduce mortality. We did not find any significant changes in hs-CRP in the CT group after the intervention. A similar study investigated the effects of CT program on markers of inflammation in patients with stable angina after PCI, and the authors reported that exercise had no significant effect on hs-CRP. It is likely that more intense resistance training is required to significantly modify markers of inflammation. It should be noted, that a higher training load may be unsafe and difficult to comply with in patients with heart failure. In terms of magnitude, Cohen's effect sizes were 0.18 for the ET group and 0.22 for the CT group. Given that the patients in our sample study received statins for 1 month before they began exercise training, baseline levels of hs-CRP were mostly within the normal range, and this may explain the small training effect. We found no significant differences between training groups in postintervention changes in NT-proBNP and hs-CRP. We, therefore, cannot claim the superiority of one training protocol over another. To our knowledge, the present study is the first to compare the effects of ET and CT on NT-proBNP and hs-CRP in heart failure patients, hence, our results should be compared to other studies with caution. Our results showed significant improvement in functional capacity after ET and CT compared to our control group, but there were no significant differences between the ET and CT groups. In terms of magnitude of the differences between changes in the CT and ET groups, Cohen's effect sizes were 0.20 for functional capacity. These findings are consistent with the results of previous studies., A meta-analysis reported that an increase in cardiorespiratory fitness of 1.5 METs after cardiac rehabilitation is associated with a 16%–54% reduction in cardiac mortality. The current study has several limitations. At first, we did not collect follow-up data due to time constraints. Second, this study only included heart failure patients with NYHA functional class I-III, thus our results may not be applicable to individuals with NYHA functional class IV nor those with severe comorbid conditions. Another limitation of our study was that women accounted for only 25.3% of the participants, so whether our findings can be generalized to both genders should be studied further. Furthermore, although the use of gas analyzer is the gold standard for peak VO2 determination, due to unavailability of this device, we predicted the peak VO2 indirectly using Bruce protocol. We suggest further studies with larger sample sizes and follow-up assessment to conclude whether the positive effects of exercise training will still remain with time. The present study showed that patients with heart failure after PCI can achieve a significant reduction in NT-proBNP and hs-CRP levels, and improve functional capacity from a short-term ET program. Besides, CT in these patients was feasible, safe, and effective in reducing the level of NT-proBNP and improving the functional capacity. There was no significant superiority of one modality over another in terms of NT-proBNP and functional capacity. Further research is required to compare the effectiveness of the two training protocols on hs-CRP level. We would like to thank the personnel at the Cardiac Rehabilitation Department of Al-Zahra Heart Charity Hospital for their cooperation, and K. Shashok (Author AID in the Eastern Mediterranean) for improving the use of English in the manuscript. This article is based on the PhD thesis of Sara Abolahrari-Shirazi (Proposal No. 94-7578). The authors wish to thank Mr. H. Argasi at the Research Consultation Center for his invaluable assistance in editing this manuscript. The authors gratefully acknowledge Shiraz University of Medical Sciences, Faculty of Rehabilitation Sciences, for scientific and financial support for this study. Kolh P, Windecker S, Alfonso F, Collet JP, Cremer J, Falk V, et al. 2014 ESC/EACTS guidelines on myocardial revascularization: The task force on myocardial revascularization of the European society of cardiology (ESC) and the European association for cardio-thoracic surgery (EACTS). Developed with the special contribution of the European association of percutaneous cardiovascular interventions (EAPCI). Eur J Cardiothorac Surg 2014;46:517-92. Kelly DJ, Gershlick T, Witzenbichler B, Guagliumi G, Fahy M, Dangas G,et al. Incidence and predictors of heart failure following percutaneous coronary intervention in ST-segment elevation myocardial infarction: The HORIZONS-AMI trial. Am Heart J 2011;162:663-70. Shemirani H, Tafti FD, Amirpour A. Comparison of no-reflow phenomenon after percutaneous coronary intervention for acute myocardial infarction between smokers and nonsmokers. J Res Med Sci 2014;19:1068-73. Jewiss D, Ostman C, Smart NA. The effect of resistance training on clinical outcomes in heart failure: A systematic review and meta-analysis. Int J Cardiol 2016;221:674-81. Cornelis J, Beckers P, Taeymans J, Vrints C, Vissers D. Comparing exercise training modalities in heart failure: A systematic review and meta-analysis. Int J Cardiol 2016;221:867-76. Passino C, Severino S, Poletti R, Piepoli MF, Mammini C, Clerico A,et al. Aerobic training decreases B-type natriuretic peptide expression and adrenergic activation in patients with heart failure. J Am Coll Cardiol 2006;47:1835-9. Smart NA, Steele M. Systematic review of the effect of aerobic and resistance exercise training on systemic brain natriuretic peptide (BNP) and N-terminal BNP expression in heart failure patients. Int J Cardiol 2010;140:260-5. Sato Y, Fujiwara H, Takatsu Y. Biochemical markers in heart failure. J Cardiol 2012;59:1-7. Giallauria F, Cirillo P, Lucci R, Pacileo M, De Lorenzo A, D'Agostino M,et al. Left ventricular remodelling in patients with moderate systolic dysfunction after myocardial infarction: Favourable effects of exercise training and predictive role of N-terminal pro-brain natriuretic peptide. Eur J Cardiovasc Prev Rehabil 2008;15:113-8. Conraads VM, Beckers P, Vaes J, Martin M, Van Hoof V, De Maeyer C,et al. Combined endurance/resistance training reduces NT-proBNP levels in patients with chronic heart failure. Eur Heart J 2004;25:1797-805. Jónsdóttir S, Andersen KK, Sigurðsson AF, Sigurðsson SB. The effect of physical training in chronic heart failure. Eur J Heart Fail 2006;8:97-101. Walther C, Möbius-Winkler S, Linke A, Bruegel M, Thiery J, Schuler G,et al. Regular exercise training compared with percutaneous intervention leads to a reduction of inflammatory markers and cardiovascular events in patients with coronary artery disease. Eur J Cardiovasc Prev Rehabil 2008;15:107-12. Alonso-Martínez JL, Llorente-Diez B, Echegaray-Agara M, Olaz-Preciado F, Urbieta-Echezarreta M, González-Arencibia C,et al. C-reactive protein as a predictor of improvement and readmission in heart failure. Eur J Heart Fail 2002;4:331-6. Ahmad T, Fiuzat M, Mark DB, Neely B, Neely M, Kraus WE,et al. The effects of exercise on cardiovascular biomarkers in patients with chronic heart failure. Am Heart J 2014;167:193-2020. Parrinello G, Torres D, Paterna S, Di Pasquale P, Trapanese C, Licata G,et al. Short-term walking physical training and changes in body hydration status, B-type natriuretic peptide and C-reactive protein levels in compensated congestive heart failure. Int J Cardiol 2010;144:97-100. Smart NA, Meyer T, Butterfield JA, Faddy SC, Passino C, Malfatto G,et al. Individual patient meta-analysis of exercise training effects on systemic brain natriuretic peptide expression in heart failure. Eur J Prev Cardiol 2012;19:428-35. McGREGOR G, Gaze D, Oxborough D, O'Driscoll J, Shave R. Reverse left ventricular remodeling: Effect of cardiac rehabilitation exercise training in myocardial infarction patients with preserved ejection fraction. Eur J Phys Rehabil Med 2016;52:370-8. Gademan MG, Swenne CA, Verwey HF, van der Laarse A, Maan AC, van de Vooren H,et al. Effect of exercise training on autonomic derangement and neurohumoral activation in chronic heart failure. J Card Fail 2007;13:294-303. Kasapis C, Thompson PD. The effects of physical activity on serum C-reactive protein and inflammatory markers: A systematic review. J Am Coll Cardiol 2005;45:1563-9. Adamopoulos S, Parissis J, Kroupis C, Georgiadis M, Karatzas D, Karavolias G,et al. Physical training reduces peripheral markers of inflammation in patients with chronic heart failure. Eur Heart J 2001;22:791-7. Pullen PR, Nagamia SH, Mehta PK, Thompson WR, Benardot D, Hammoud R,et al. Effects of yoga on inflammation and exercise capacity in patients with chronic heart failure. J Card Fail 2008;14:407-13. Astengo M, Dahl A, Karlsson T, Mattsson-Hultén L, Wiklund O, Wennerblom B,et al. Physical training after percutaneous coronary intervention in patients with stable angina: Effects on working capacity, metabolism, and markers of inflammation. Eur J Cardiovasc Prev Rehabil 2010;17:349-54. Beckers PJ, Denollet J, Possemiers NM, Wuyts FL, Vrints CJ, Conraads VM,et al. Combined endurance-resistance training vs. 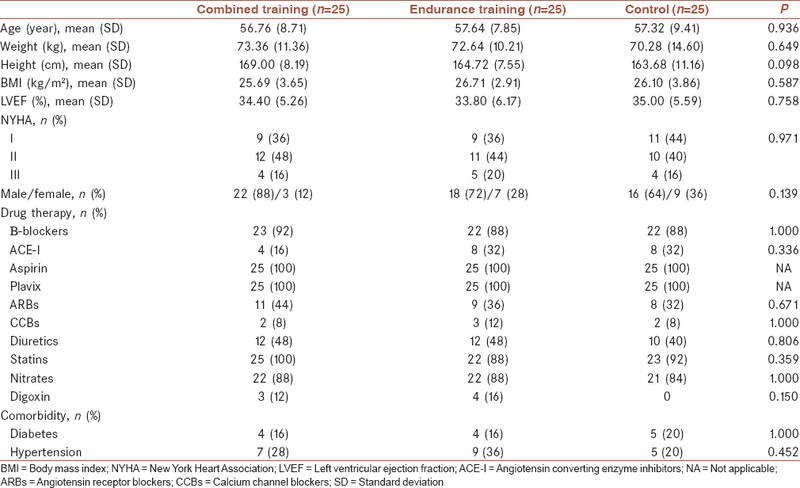 Endurance training in patients with chronic heart failure: A prospective randomized study. Eur Heart J 2008;29:1858-66. Mandic S, Tymchak W, Kim D, Daub B, Quinney HA, Taylor D,et al. Effects of aerobic or aerobic and resistance training on cardiorespiratory and skeletal muscle function in heart failure: A randomized controlled pilot trial. Clin Rehabil 2009;23:207-16. Sandercock G, Hurtado V, Cardoso F. Changes in cardiorespiratory fitness in cardiac rehabilitation patients: A meta-analysis. Int J Cardiol 2013;167:894-902.